While we wish otherwise, there is no definitive answer for this question. Are you a champagne and caviar person? Or are you happy with a cold Iron City and a hot dog? Do you fancy five star resorts or camping under the stars? Before we embarked on our journey ‘round the globe, we consulted a number of travel blogs for guidance on budget. The experiences and information they shared — ranging from backpacker to high roller budgets — were a huge confidence booster for us. After 50 weeks on the road, we tallied our numbers and, in the spirit of payback, share our expense breakdown with you, along with commentary and lessons learned. We hope our data helps you with your Round the World trip planning. As you can see, Tanzania was the most expensive country we visited. The reason? We chose to hike Mount Kilimanjaro and go on a safari in Tanzania through a USA-based tour operator. You know the standard conundrum: Time, Quality, Budget. You can only choose two of the three. For most of our travel around the world, we had no time constraints, which gave us leverage to find (or create our own) quality excursion experiences that did not strain the wallet. In Tanzania, however, we met family and friends from America who had only two weeks of vacation to spare. The group tour provided a jam-packed itinerary and a high-quality experience, but it cost us five times our target daily budget. For us, it was worth the trade-off, however, to share some of our travel time with my cousin, his wife, and our BFF. In the daily breakdowns below, please note that the cost of the Mount Kilimanjaro climb and the safari (accommodations, transportation excluding international flight, and food) are lumped into Daily Admission Cost for Tanzania, which is the category we use to track expenses such as walking tours, admission fees, attraction tickets etc. The daily lodging, food, and transportation cost breakdowns for Tanzania reflect the independent travel we did in Zanzibar, a Tanzanian island, after the organized group tour. These numbers represent a more accurate picture of daily living costs in Tanzania, without group overhead. Where Did You Sleep and How Much Did It Cost? In 50 weeks of travel, we stayed in 103 different places, with an average daily cost ranging from USD$20-$40. This represents a mix of 45 single night stays (mostly while hiking or transiting) and 58 longer term stays of a week or more in some cities. Accommodation prices averaged a little higher in Argentina because my Mom and aunt joined us for two weeks, so we rented more spacious apartments. For multi-night stays, we primarily rented comfortable, clean, one bedroom, one bathroom, private occupancy apartments through AirBnB, Booking.com or Trip.com (in China); a well equipped kitchen was an important feature for us. On a few rare occasions, we stayed in a hostel and had a surprisingly pleasant experience, especially when we opted for a private room. Hostels are a great way to connect with other travelers and English-speaking staff to get the low-down on a place. Occasionally, we also stayed in traditional hotel rooms. The key point about the types of places we stayed is that we were rarely uncomfortable (with the exception of High Camp on the Annapurna Circuit! LOL!). We did not sacrifice cleanliness, convenience, or comfort for the sake of a few dollars. 90% of the time, we had western toilets, hot water, wifi and other modern conveniences. Did You Eat Out or Cook Your Own Food? While we traveled the world, we ate out and cooked our own food, averaging less than USD$30 per day ($5 per person per meal). This includes coffee and alcoholic beverage consumption, in addition to groceries, street food, and restaurants. In some countries (such as Vietnam, India, Nepal), it was cheaper and more convenient to eat out than cook. Eating out also gave us the experience of new tastes, smells, presentation and cooking methods. But we also enjoyed cooking when we could. It gave us a sense of home, routine, and control over our diet. We traveled with a variety of spices, olive oil, balsamic vinegar, and a condiment or two acquired in-country. It’s amazing what you can whip up with just the basics, plus some vegetables, yogurt, eggs, tofu and other ingredients acquired from the local market. If nothing else, just having coffee and fruit or pastries on hand for breakfast is a good way to stay sane and avoid the hassle of finding food in the morning. Coffee beans and coffee shops around the globe are irrationally over-priced. We shed our former coffee snobbery and mostly carried our own instant coffee. Same with beer and wine — we found it more fun and certainly cheaper to drink local brand brews than to seek out imported brands. We also learned that choosing vegetarian meals was cheaper than meat or fish. I wrote an entire post on temporarily being vegan while traveling for a variety of reasons. It’s not for everyone, but consuming less meat will save you money. Transportation costs include all expenses, taxes and fees related to planes, trains, automobiles, motor scooters, ferries, rickshaws, Uber and taxis, public transportation, rental cars, tolls, gas, and parking fees. Overall, transportation costs were relatively low because we used airline miles for six major international flights (from Korea to Vietnam to India and then from Kenya to Argentina to New York City — more on this below). We paid out of pocket for flights to Cambodia, Nepal, China, and Kenya. I explain what’s up with Kenya further down. Biggest takeaway: When you amortize the cost of a flight over the number of days spent in a location, you can see that slow travel pays. Our flight to Cambodia, for example, was $500 round trip from/to Vietnam, but we only stayed for four days, so that made the average daily transportation cost in Cambodia quite high. Compare this with China, where the one-way ticket for two people was $500 but we stayed for two months. Inspiration for our trip around the world came from the Sky Team Alliance points we had earned while traveling for business and vacations. By mainly choosing airlines within the Sky Team Alliance network, we eventually accumulated enough points for two Round the World Bonus tickets through Korean Air’s SkyPass program. This was a HUGE money saver for us. We paid $1500 total (just taxes and fees) for airplane tickets valued at $14,000! In accordance with the rules of the program, we could choose six major destinations. Our major flight plan was as follows: Seoul —> Hanoi —> Mumbai —> Nairobi —> Buenos Aires —> New York —> Seoul. 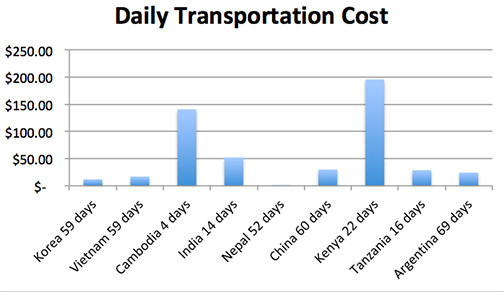 Why is the daily transportation cost in Kenya so high? We blame India. India’s abysmally incompetent visa processing department failed to deliver my 2nd Indian visa after we left India to travel to Nepal and China. It’s a long and infuriating story, so I’ll cut to the outcome. We were unable to return to Mumbai in time for our pre-paid Mumbai-to-Nairobi leg of our Round the World trip itinerary through SkyPass. We were forced to buy USD$4,000 flight tickets from Seoul to Nairobi (by-passing India) in order to make it to Tanzania in time for our group tour (another strong case for the flexibility of independent travel). 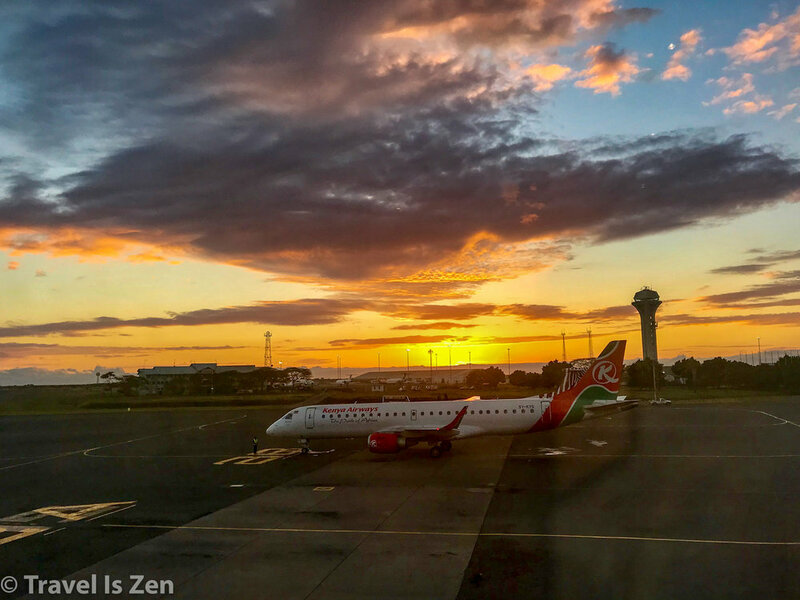 We amortized the additional flight cost over the duration of time we spent in Kenya, which explains the high average daily transportation rate. BTW: The ineffectual Indian bureaucrats responsible for this costly flub shamelessly lied, never apologized, and refused to accept any wrong-doing. I never did get my e-visa. Par for the course in India. Did You Have Cell Service and Internet Access? Compared with the United States, the cost for cellular phone service with a data plan around the world is cheap! We traveled with unlocked iPhones, purchasing SIM cards in 7 out of 9 countries. We used our cell phones for voice communication, map navigation and language translation. We did not want to rely solely on wifi, so we routinely purchased data plans in excess of 2 GB per month, which was about right for our travel needs. Cellular service (and wifi, for that matter) in most countries was excellent (except India). Overall, we were quite happy with the price, accessibility, and quality of cellular service abroad. Did You Have Any Fun? Were Attractions Pricey? The “Admissions” category is where we tracked expenses related to walking tours, group excursions, museum or show tickets, park entry fees, hiking permits, country visa fees, wine tastings, and so forth. It’s quite a broad category, but represents the cost of “doing fun stuff”. We amortized the cost of attraction fees for each country across the days that we spent touring that country. We spent less time in Cambodia and India relative to other countries, so daily admission costs appear higher (again, slow travel pays off). As I explained earlier in the post, the majority of our time in Tanzania was spent hiking Kilimanjaro and going on safari through a group tour. We lumped the USD$6,000 cost of this tour (food, transportation excluding international flights, lodging, staff tips, and trip fees) into the Admissions category. That is why the average daily cost for Tanzania is so high. Miscellaneous is the bit bucket category into which we lumped expenses related to language classes, charity and gifts, clothing, cosmetics, medical costs (medicines, insurance, doctor fees), annual subscriptions, book and iTune purchases, laundry, souvenirs, sun screen, ponchos… the list goes on. We invested in one to two week private language classes in Vietnam (Hidden Hanoi Language School), China (Huayang Academy in Kunming) and Argentina (Vamos Spanish Academy in Buenos Aires). As you can see, it barely made a bump in our budget and the cost was worth every penny! In the middle of our trip, we returned to my husband’s hometown of Seoul, South Korea, for two weeks. By this time, we had a proper idea of what we needed in terms of clothing (layers and quick dry fabrics, please! no whites!). Our shoes had worn out, jackets had torn, socks had holes and we were ready to overhaul our wardrobe. South Korea’s outdoor gear is of exceptionally high quality. Brands like Kolon and Black Yak are a bit expensive, but we shopped at outlets and took advantage of sale prices. Revamping our wardrobe is the reason for the spending spike in Korea. When we originally departed the United States, we really did not know what type of clothing we would need, so we did not shop for anything in particular before we left. We just took clothes that we already had and that were comfortable. This strategy worked well for us because we learned as we traveled what we liked to do and what we needed…and we tossed what was useless (a LOT!) along the way. By the end of our journey, our clothes and shoes (for all seasons) fit into two backpacks weighing 11 kg and 13 kg (about 25 pounds). Travel in the shoulder months, just before or after prime tourist season in each country. Usually the prices and the crowds are half of what they would be during the height of the season. Choose vegetarian options over meat, shop in local markets and cook your own food to save money. Relax and stay a while. Slower travel = cheaper travel. Hopping around from country-to-country or city-to-city is expensive. The longer you can stay put, the more you will get to know a place. You will find out which restaurants or vendors have the best prices, you will get long-term stay discounts on your accommodations and you’ll save on transportation fees. Choose and plan your own adventures. Independent travel is far cheaper than professionally organized tours. If you have the time to plan your own excursions, do it. Consult travel blogs, local information resources (your AirBnB hosts, tourist info centers, other travelers at hostels), use itineraries prepared by group tours as a starting point… It’s actually more fun and rewarding to plan and execute your own tour. You will save a ton. Use debit and credit cards that reimburse or do not charge foreign transaction fees. We used the Charles Schwab debit card, which reimbursed over three hundred dollars in ATM transaction fees, and the Chase Platinum credit card, which does not charge a foreign transaction fee. Are you dreaming of an extended trip around the world? Or did you already take the plunge and have the scrapbooks and scars to prove it? Share your questions and stories in a comment below or tag us on social media (Instagram) @travel.is.zen or (Twitter) @TravelisZen. BE BOLD. DREAM BIG.